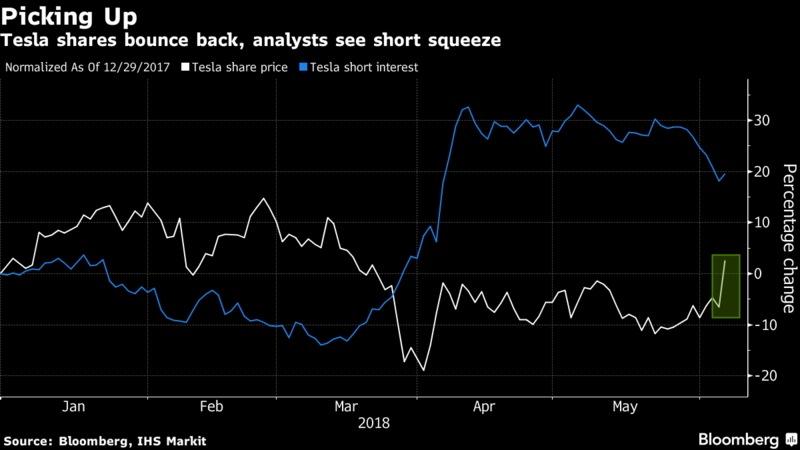 Tesla Inc. analysts say a short-seller squeeze may have been behind the stock’s gain of almost 10 per cent on Wednesday, its best performance in more than two years. As Morgan Stanley put it, the stock move reflected “more on investor positioning” rather than a reaction to “truly incremental data on fundamentals.” While most of the information coming out of the company’s shareholder meeting this week wasn’t new, Wall Street is honing in on Chief Executive Officer Elon Musk’s commitment to his ambitious Model 3 production goals and forecast for positive net income and cash flow in the second half of the year. Notable comments at the meeting that may have led to some short squeeze included all parts of Model 3 production capable of 500 units a day/3,500 a week, and Tesla’s reasonable confidence that a 5,000-units-a-week production rate could be met by the end of the quarter. Also notes the outlook for positive GAAP net income and cash flow in third and fourth quarters, confirmation of plans to build a factory, battery and vehicle in Shanghai -- with details to be released shortly -- and the teaser of Model Y, which will be revealed next March. The “biggest drivers” of Wednesday’s outperformance included Tesla’s 5,000 Model 3 per week goal, the reiteration of earlier guidance that GAAP net income will be positive in third quarter, with positive cash flow in third and fourth quarter, and Tesla still insisting that no incremental debt or equity will be required. Potter also notes that an attempt to strip Musk of his chairmanship failed.